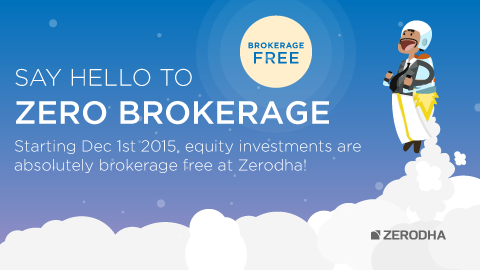 Zerodha, the new generation broker is now offering absolutely brokerage free starting 1st Dec 2015. Since this would be helpful for our readers, we are publishing the details taken from Zerodha website. No upfront fees, no minimum volume, no special terms for delivery based calls. "As a business we have hit a point of realization of how shallow the stock market participation is in India, probably not more than a million active investors (<0.1% population). Not just for brokerage businesses like us, but economic growth in a modern economy hinges on vibrant capital markets. 65% of Indian population is below the age of 35, and something has to be done to attract them to start investing in the markets. For this to happen, I think we need to bring in coolness into the brokerage business." How does Zerodha make money then? •F&O and intraday equity trades are still charged at a flat Rs 20 per executed order as before. •Zerodha will soon be starting margin lending for equity delivery. •Zerodha hopes that this initiative will help grow our client base and business. Recently we moved to Zerodha and the experience is simply amazing!!. So guys, just go for it. They have excellent platforms which help us in even tax calculation. Fill in your name, email address and phone number. Their customer service will contact you. Dear Sir, When will you share your next multi-bagger stock? Your last post was in last week of October. Please share one stock idea per month. I proffered the best Discount Broker in India. They have good Share trading tools.